we thought you might like it too. The latest information from The Honeycombers; read all about it. 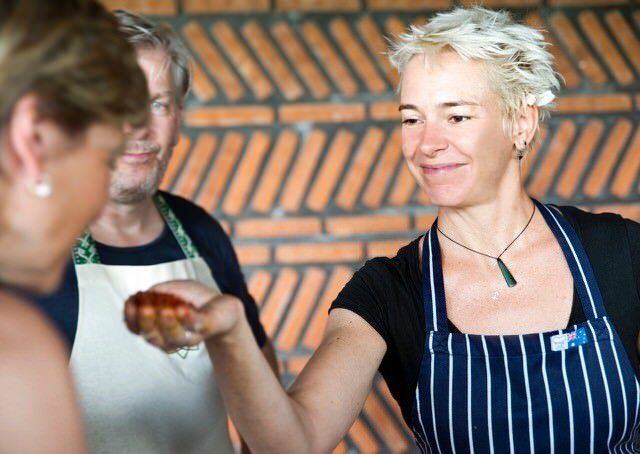 Bali Asli has been named as one of the “Top 5 Restaurants in Bali” by the ‘Dialaflight’ group in UK. You can find modern convenience stores throughout Indonesia, but it’s their morning produce markets where you’ll see what nourishes the country’s soul. After hours of surfing, hunger kicked in, so Local Style traveled to the foothills of Mount Agung in East Bali to find organic and healthy food options. They had a chance to tour the colorful Amlapura market and absorb the sounds and smells, sample some produce and check out what the hustle and bustle was all about. Produced by NamHee Han. Visit the Local Style Facebook Page to keep up with the show. 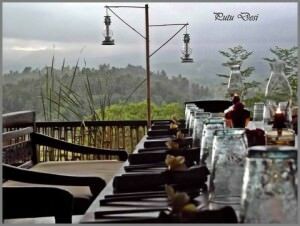 BALI ASLI is located in Gelumpang village, near the town of Amlapura, the capital of Karangasem regency, in the North East of Bali. It is about 2 hours drive from the airport and 30 minutes from both Candidasa village and Amed village. 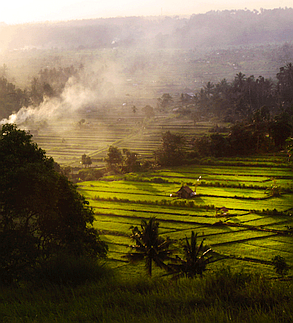 BALI ASLI is nestled in the foot hills of Mount Agung, Bali’s most sacred mountain and surrounded by rice paddy fields; there is not a building to be seen. Fell In Love With Bali! When I was working at Alila Manggis as their Executive chef, I felt the urge to connect my self to this beautiful part of Bali in a more permanent way. I mentioned to a couple of Balinese friends that I might be interested in buying some land. Well, about a hundred people came out of the woodwork to offer me land that their family, friends, friends of friends and distant acquaintances had for sale!! So on my next day off one of them managed to talk me into jumping on the back of their motor bike to go and inspect a plot of land; he showed me 2 actually. The first one was down a 200 metre track that was bound to cause issues later with getting goods and equipment in and out, so I was taken to another place that took my breath away. It was perfect in every way except it was too expensive!! I was feeling very frustrated. Why is it that the things you want are always just out of reach? Anyway, the fellow’s friend who owned the land was happy to negotiate, so the process began and about 1 month later we agreed on a price. I now had to find the money. I stalled the land owner as long as I could. I checked my account and credit cards over and over. I tried to get an international loan. I tried to get a Balinese bank loan, then a Balinese bank loan via a Balinese person as guarantor!!! Finally I managed to get an increase on my visa card!!!! I called the land owner, Mr Dahmawan and told him we could go through with the sale. I drew up a document on an A4 piece of paper; we stuck a duty stamp worth IDR6000 to it and we signed on the stamp!!! The deal was done, I was connected to Bali in a more permanent way!